For a completely clear shampoo, it’s surprisingly not terrible. WATER/EAU, SODIUM LAURETH SULFATE, SODIUM LAURYL SULFATE, SODIUM CHLORIDE, FRAGRANCE/PARFUM, ROSMARINUS OFFICINALIS (ROSEMARY) LEAF EXTRACT, MENTHA PIPERITA (PEPPERMINT) OIL, MENTHOL, MENTHA ARVENSIS LEAF OIL, HISTIDINE, ALOE BARBADENSIS LEAF JUICE, ECKLONIA RADIATA EXTRACT, SODIUM CITRATE, SODIUM XYLENESULFONATE, COCAMIDOPROPYL BETAINE, SODIUM BENZOATE, HYDROXYPROPYL METHYLCELLULOSE, CITRIC ACID, TETRASODIUM EDTA, METHYLCHLOROISOTHIAZOLINONE, METHYLISOTHIAZOLINONE. 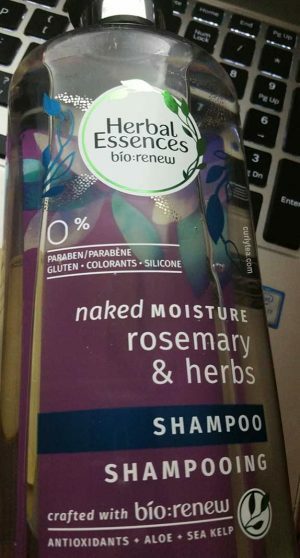 The Rosemary And Herbs Shampoo smells… like cheap soap. I’ve smelled much better Herbal Essences products than this. I don’t completely dislike it, but I’ve smelled better. Normally, I stay away from clear shampoos like the plague because it generally denotes that a shampoo will be very clarifying: strips all the oils from your hair/scalp leaving it super dry. This is a fully sulfated shampoo. My Curlyteas who hate sulfate with a passion will not want to use this shampoo. It has SLS and SLES (read below). However, if you have a ton of product build-up, this may be one of the shampoos to use to break through all of it. It did what is was supposed to do, but it didn’t leave my hair feeling dry or super-stripped. There are two things I have to add though. First, my conclusion could be because I used it when I had a noticeable amount of buildup to get rid of. Second, I don’t regularly use sulfated shampoos. I use shampoo, yes. I’ve long since left the “cowash” days behind. You hair needs to be clean or else your other great leave-ins and curl creams may not work as well. So, I don’t know if using this product on a consistent basis will cause the dreaded dryness we all hope to avoid. Just be mindful of that. In the past I have recommended to dilute regular shampoos with water if you’re concerned that the percentage of surfactants will cause your hair to dry out. 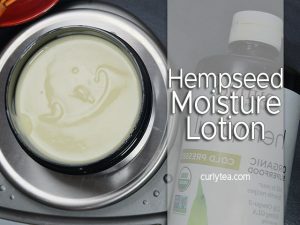 There is more fragrance in this formula than there is Rosemary leaf extract. It also contains Peppermint oil and Menthol. SODIUM LAURYL SULFATE – Sodium Lauryl Sulfate (SLS) is “the sodium salt of lauryl sulfate” which is also a surfactant used to clean the hair. It’s also known as “sodium dodecyl sulfate”. It gets a 1-2 on EWG.org depending on the usage. SODIUM CHLORIDE – Sodium Chloride is regular table salt. It’s often used to “increase the thickness of the…water portion of cosmetics and personal care products”. 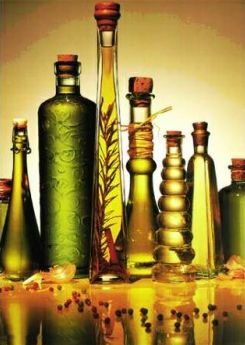 HISTIDINE – Histidine is an amino acid also used as a “fragrance ingredient” and “skin-conditioning agent”. It gets a 1 on the EWG.org scale. It’s nothing special, in my opinion. My hair was clean without feeling stripped. I don’t know what your experience will be if you use a lot of the product or if your hair didn’t have the amount of buildup my hair did when I used it. 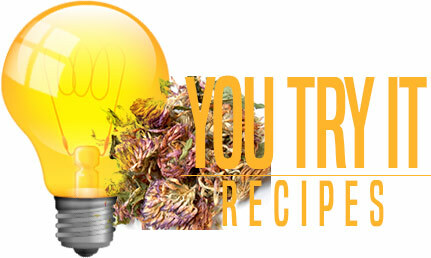 It’s clear, which usually means there aren’t any additional ingredients, like traditional oils.